One of the reasons that residents love Sierra Vista is that it has a small-town feel with many of the amenities that you would otherwise need to go to a larger city to find. For example, did you know that Sierra Vista has its own symphony orchestra and local arts association? These, in combination with nearby galleries in the artsy towns of Bisbee and Tombstone, create a thriving art community where you can be both an observer and a participant. The Huachuca Art Association, or HAA, is a non-profit community that works with many local artists, hosting a gallery, community events, and classes all with an emphasis on the visual arts. Anyone can become a member and enjoy workshops covering skills from drawing to watercolor painting to pottery to woodworking. Gallery – The HAA Gallery is open Tuesday through Saturday and exhibits a variety of works from their local artists, including oils, watercolors, pen and ink pieces, colored pencil drawings, wood carvings, pottery pieces, Native American art, and sculptures. There is a featured artist of the month show, and the gallery hosts scheduled artists demonstrations. All artwork is available for purchase, and there are small gifts and prints offered in the gallery as well. Artist Community – HAA Artists have come from all walks of life and backgrounds to solidify a place for visual arts in Sierra Vista and the surrounding communities. These artists are featured regularly in the Gallery and their talents are shared through member workshops. Art in the Park – Perhaps the most notable event that the Huachuca Art Association organizes is the annual Art in the Park showcase. This event takes place every October at the Sierra Vista Veterans Memorial Park, and it brings artists not just from Arizona, but from several states to showcase their work and participate in the local arts community. 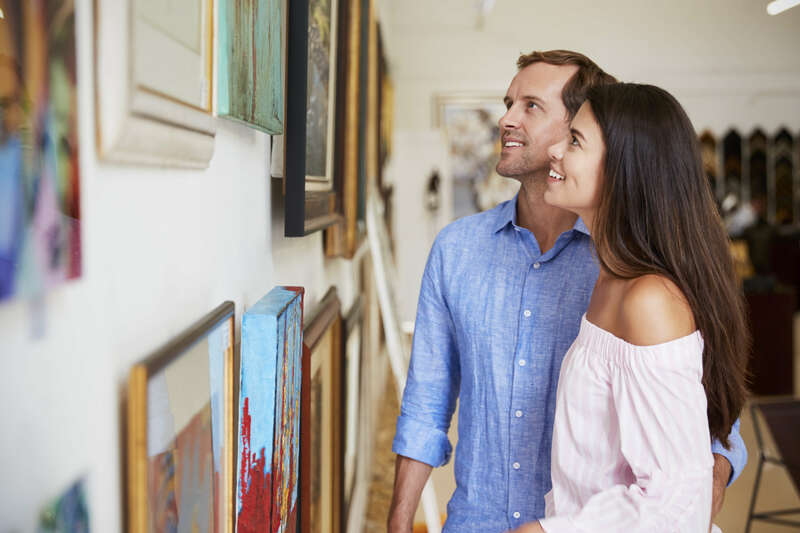 Whether you’re shopping for art pieces to display in your home or you just simply love traveling to art galleries with local flair, a day trip to Bisbee should be on your to-do list. Bisbee is only a short drive from Sierra Vista, and with a small detour on a scenic drive, you can add Tombstone to your trip as well. Bisbee is an artists’ town with a distinctive old time feel, since many of the relics of its mining past still stand today—although they’ve been put to alternative use. Tombstone offers an immersive historical experience, and there is some unique art on display there as well. PanTerra Gallery – While not strictly an art gallery, PanTerra showcases photography and fashion from independent designers from around the world. Here you can find one-of-a-kind additions to your wardrobe, framed photography, and locally crafted jewelry. Metalmorphosis – As the name would imply, Metalmorphosis is a gallery specializing in metal work. From small designs like wall art and light switch covers to large, statement pieces like sculptures, you will be amazed to see the amazing metal creations that this shop and gallery has on display. 55 Main Gallery – At 55 Main Gallery, you will find a carefully curated selection of pieces from nearly 100 local artists. Pottery, art, music, sculptures, jewelry, and clothing are all items you might find inside. Tombstone Gallery – Tombstone is a spectacle in itself, but the Tombstone Gallery is where you will find original paintings, tooled leather, and other distinctly Southwestern crafts. Visual arts are not the only creative endeavor you will find in Cochise County. The Sierra Vista Symphony Orchestra hosts concerts at the Klein Center for the Performing Arts with seasonal performances throughout the year. In January, you won’t want to miss the Space Exploration concert, which will showcase works from Strauss, John Williams, Horner, and Liszt for a dynamic lineup. The concert will also begin with a lecture for an immersive musical experience. In April, you can look forward to At Last, a symphonic tribute to Donna Summer. If you are considering a move to Sierra Vista, you won’t find yourself short on things to do, see, and discover in your new hometown. You will also feel right at home in your new community built by Castle & Cooke. Our neighborhoods feature all the amenities you could want with customizable floor plans to provide your family with a beautiful, functional space to call home. Learn more about us on our website or call (520) 378-5110.